JACKSON - West Tennessee Healthcare is pleased to announce Dr. Bob Pryor as chief physician executive for the system. Dr. Pryor comes to West Tennessee after serving as senior vice president with Kaufman Hall Associates, a healthcare consulting company. 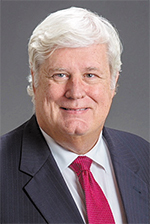 Prior to his work with Kaufman Hall Associates, he was the president and chief medical officer for Baylor Scott & White Health, the largest not-for-profit health care system in Texas with 53 hospitals and more than 900 access points. "I am pleased to join the tremendous people at West Tennessee Healthcare and become part of the family of those who care for our communities," stated Dr. Pryor, when asked about his new role. "Dr. Pryor's extensive experience in healthcare is a great asset for our organization," said James Ross, president and chief executive officer of West Tennessee Healthcare. "He's a proven change agent, and he was instrumental in the 2013 merger of Scott & White Healthcare and Baylor Health Care System. We are so pleased that he is now going to share his expertise with our health system." Dr. Pryor attended medical school at University of Texas and completed his post graduate training, focusing on pediatrics, at University of Oklahoma and Baylor College of Medicine in Texas. In his new role at West Tennessee Healthcare, Dr. Pryor will work on engaging medical staff in robust clinical quality integration and improvement initiatives, patient safety standardization and physician leadership development and engagement.